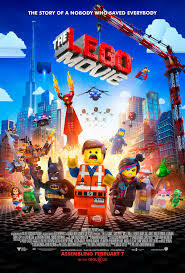 The film is based on the Lego line of Construction toys and was released on February 7, 2014.
the lego movie was a complete movie made with lego toys ,the lego city was really interesting and the characters were too made up with lego construction toys .the movie had a message and the movie made you just want to be part of the lego city ,with character like batman and superman made from lego made it more fun to watch ,also it was a animated action movie . and last but not the least Everybody is awesome. A 3D computer animated story follows Emmet, an ordinary, Discplined , perfectly average LEGO minifigure who is mistakenly identified as the most extraordinary person and the key to saving the world. He is drafted into a fellowship of strangers on an epic quest to stop an evil tyrant, a journey for which Emmet is hopelessly and hilariously underprepared.